Most experts agree that there is significant decline in polar bear populations taking place. Increases in global temperatures has resulted in the destruction of the bears' natural habitats. As a result, many of these creatures are having a hard time finding adequate amounts of food. A recent report published by Earth hour and the World Wildlife Federation (WWF) estimated that wild polar bears could become extinct by the end of this century. According to the report, "the thinning and earlier break-up of sea ice in the Arctic is believed to be reducing the body weights of female polar bears and by 2012 the average body weight may be too low for them to reproduce." Of the world's 19 polar bear sub-populations, 5 are in a state of decline and 7 more could be facing the same problem (though more data needs to be collected to confirm this hypothesis). Fortunately, several of these subpopulations are coping with global climate changes. In fact, scientists believe that in Churchill, Manitoba - the "polar bear capital of the world" - their numbers might actually be increasing. Churchill is a convergence point for over 1,200 polar bears each fall ad they move towards shallow waters to hunt for winter meals. Thousands of people visit this Hudson Bay town each year to get an up-close look at the world's largest land predator. The polar bear's brief migration period, and their potential disappearance, makes it crucial that anyone who wishes to see these creatures does so as soon as possible. While visiting Churchill, tourists are treated to regular sightings of other animals, such as the rare arctic fox. Thos who venture out on the Churchill river may even catch a glimpse of the endangered Beluga whale. If you wish to see the beauty of the vanishing polar bears, plan a 5 to 7-day trip to Churchill, Manitoba this fall. Fresh Tracks offers a wide variety of packages that will allow you and your family to get a close up view of these large predators. 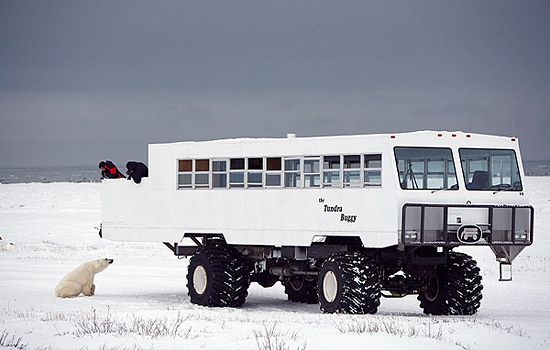 You will be escorted by trained professionals in an enclosed Tundra Buggy to ensure that you stay safe, but still get a face-to-face look at possibly hundreds of Canada's polar bears. Let Fresh Tracks' Canada Polar Bears website help you plan your Canada vacation. We have some of the most reasonably priced Churchill polar bear viewing packages available online, and can even help you customize your own trip. Need more information on Polar Bear Tours in Churchill? Talk to one of our Canadian travel Insiders who'd be happy to answer all your questions.